The first hard evidence for the grandmother hypothesis was gathered by Kristen Hawkes, an anthropologist at the University of Utah who was studying the Hadza people, a group of hunter-gatherers in northern Tanzania. Hawkes was struck by "how productive these old ladies were" at foraging for food, and she later documented how their help allowed mothers to have more children. In 1608, French Catholic priests in what is present-day Quebec began recording every birth, death and marriage in their parish. As settlers continued to arrive, multiply and fill the St. Lawrence Valley, parish records ballooned. "We had the data set of the first French settlers coming off the first boat," says Patrick Bergeron, an evolutionary biologist at Bishop's University, who co-authored the study. Hawkes explains that this approach adds nuance to previous studies of the grandmother hypothesis, which didn't directly measure proximity. "After all, if you're in Quebec but your grandma's in Cleveland, she may not be much help," she says. It turned out that staying close to grandma paid off in family size. Women who lived 200 miles from mom had, on average, 1.75 fewer children than their sisters who lived in the same parish as their mother. "Women in those days had a lot of kids, on average almost eight," says Engelhardt. But times were tough, and about half of a woman's offspring died before age 15. Such harsh conditions led to a range of reproductive success; the number of grandkids per grandmother in this database ranged from one to 195. Altogether, these results are what you'd expect if the grandmother hypothesis is true. "These results are really interesting," says Hawkes. "They took a much more fine-grained approach, and it gives us a clearer picture of the effect of grandmothers." But if grandmas are so beneficial, why don't they live even longer — long enough to help their great-grandchildren grow up and have kids of their own? To answer that question, you need to consider not only how much help a grandmother can give but also how the opportunity for a grandmother to help changes over time. 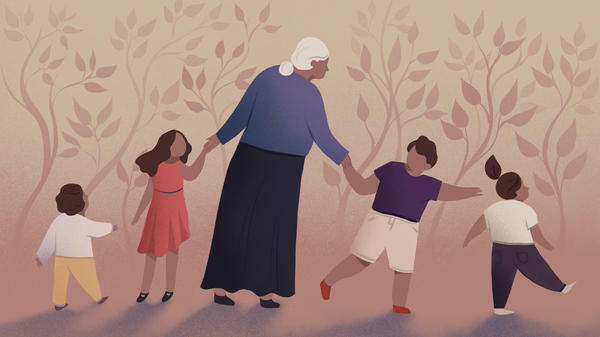 If a grandmother's abilities deteriorate with age or if there just aren't as many grandkids around to help, the evolutionary benefits of living longer might disappear. In Finland too, the presence of a grandmother boosted a daughter's total number of offspring. But closer inspection revealed some caveats. Having a grandmother age 50 to 75 increased a toddler's chance of surviving from age 2 to 5 by 30 percent. But the researchers found that the benefits of having a grandmother petered out after she passed age 75. In fact, the presence of an older paternal grandmother reduced a newborn's probability of surviving to age 2 by 37 percent. Why? Too many mouths to feed, according to Chapman. "At this time, paternal grandmothers often lived in the same home as their son and may have required extra care," he says. That may have shifted resources away from younger grandchildren. But as grandkids grow older, grandma's help doesn't have the same impact, and the evolutionary value of living much longer decreases. Chapman found that grandmothers' mortality rates shoot up just when this dip in opportunity for helping arrives. For most of human history, this kind of knowledge was transmitted orally. "In North American indigenous communities, you see the transmission of agricultural knowledge across generations," she says. "In many cases from grandmother to grandchild." How did your grandmother help your family survive and thrive? And is there a piece of valuable advice she's handed down to you? Share your stories on Twitter. Pictures of you and grandma are welcome!